Dégustez vos propres créations après une variété d'arrêts de dégustation - de quoi vous régaler pour le déjeuner! 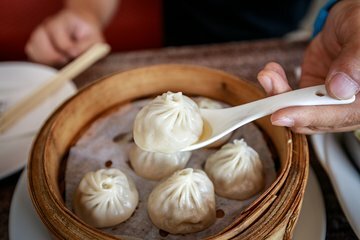 Accueillez votre guide gastronomique dans un lieu central de Shanghai et commencez votre visite à pied de l'ancienne concession française, une zone coloniale pittoresque regorgeant de stands de nourriture alléchants. Regardez les vendeurs préparer des spécialités locales fraîches et commencer à goûter votre chemin à travers la ville; régalez-vous de huit échantillons au maximum et savourez les saveurs uniques de guotie (boulettes frites); jiaozi (raviolis de style nordique); hun tun (wontons); et le célèbre xiaolongbao (raviolis à la vapeur cuits à la vapeur) de Shanghai. Écoutez votre guide vous donner un aperçu fascinant de la signification culturelle de la nourriture à Shanghai et admirer le paysage tout en vous promenant dans l'architecture Art Déco jusqu'au lieu de votre cours de cuisine. Saluez votre chef professionnel et assistez à une démonstration sur la fabrication du har gow, une spécialité de dim sum cantonais qui se présente sous la forme d’emballages de pommes de terre à la vapeur farcis aux crevettes. Sous la direction de votre chef, préparez vos boulettes et faites-les cuire à la perfection avant de vous laisser aller à la délicieuse friandise. We really enjoyed this tour! We ate an amazing variety of dumplings. Definitely go in hungry. Our tour guide was a lot of fun and very informative. We then finished with a cooking class and made some delicious dumplings of our own. Loved the dumpling tour and class. This was an absolutely fantastic tour. Our guide Rosie was knowledgeable and engaging. The food was fantastic at each stop, and my children ages 9 and 12 particularly loved learning to make dumplings. You can't go wrong with this tour, and go hungry. We made the mistake of eating breakfast first and should have just waited to eat with the group. Had a great few hours with Thomas.....loads of amazing taste experiences, you have to go very hungry and there are so many amazing foods to try, delicious! Ended up just two of us making sind dumplings, very good tour! One of the best tours I have ever done! Our guide was so knowledgable and welcoming and an absolutely sweetheart. But please be warned DO NOT EAT BEFORE THIS TOUR!! You need all the room in your stomach for the enough amount of different dumplings that are offered. The cooking class was fun and we were given a great handout with recipes and advise. I highly recommend this tour and I may even do it again when back in Shanghai!! This tour is awesome! Authentic local food, tour guide was very knowledgeable with interesting and fun facts to share. The cooking class was great as well! We will definitely try the Night Eats tour the next time we're in town! Thanks!! Absolutely loved this tour! Nyima was our guide and she was fantastic! She had so much knowledge. Everything we ate was so tasty and there was so much food we got to a point where we had to ask how much was left so we knew we would have room for it! The cooking class was heaps of fun too. The chefs were great and helpful. Highly recommend this tour! so delicious! Our guide Niyma was amazing! She was so informative and friendly, accommodated everyone's needs, and had a wealth of information to share about the place she now calls home. The tour itself was well worth the price. My friend and I had a very short visit to shanghai and wanted to experience as much of the food and culture as possible. Having an English speaking guide was critical, we quickly discovered, as the locals don't typically speak English, and we can't speak or read Mandarin. Niyma was our gateway to the fabulous food of Shanghai, and when Untour Food Tours says to come hungry, they mean it!! Pace yourself, and this food tour does not skimp! They will even give you more if you want it! We were able to sample steamed pork dumplings potstickers to us Americans, Shanghai noodles, xiaomai, a variety of steamed meat dumplings with and without broth inside, vegetable dumplings, and xiaobao breaded dumplings filled with either vegetables, custard, or black sesame. And that doesn't include the dumplings we made!! Of course my favorite part was making my own Xiaolongbao! It was so much easier to do than I thought it would be! And it tasted delicious! Each person made then ate about 6-8 dumplings! Afterwards, our guide gave each of us the recipe so we could recreate our dumplings at home. She also gave us some great suggestions for other activities to do around Shanghai! We ended up visiting one of those recommended sites: the Zotter Chocolate Factory! A must do as well! !